As someone who played General Grievous and 10 to 1 odds that he/she will say that it was Matt Wood. Wrong! Although Wood voiced Grievous, it was Australian fight/swordmaster Kyle Rowling that provided his moves. 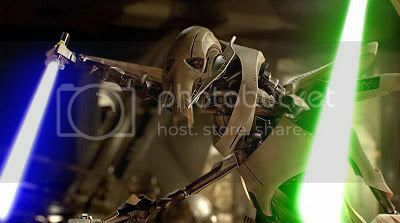 Not only did Rowling portray Grievous, he also played Jedi Joclad Danva and a MagnaGuard and trained Ewan McGregor, Hayden Christensen, Christopher Lee and Ian McDiarmid. 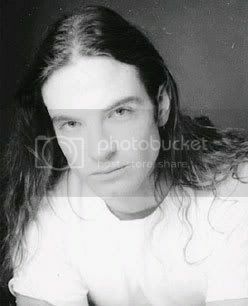 Wattographs' Gary X and I had the following interview (that was initially published on Wattographs.com) with Kyle. I’ve always loved any form of martial combat. Actually, when I was a kid I had a much bigger fixation with guns. However our country doesn’t have the same kind of laws as you do. (editor's note: Kyle lives in Sydney, Australia) We don’t have "the right to arm bears" or even own guns. Gradually the firearms laws got tougher and tougher and that was an end to that. However, I had been studying martial arts since I was eight and therefore I had a lot of skill and a great love for many different types of weapons. But, one day when I was in my late teens I rented a movie called Highlander. Well, that was it for me. I watched it four times in 24 hours. 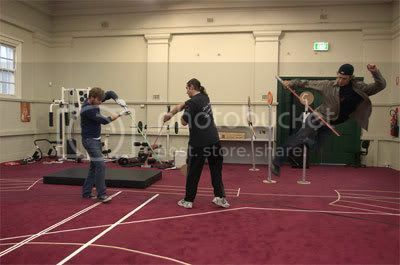 A few years later I joined The Society of Australian Fight Directors and I have been doing Stage Combat and working as a Fight Director since. The first Star Wars film I ever saw was actually The Empire Strikes Back. My brother took me to a drive-in and left me sitting on the bonnet watching the movie while he made out in the back with his girl. I was transfixed. It was the most incredible thing I had ever seen...the movie that is, not my brother and his girl. I then saw A New Hope on video and was all up to speed by the time Return of the Jedi came out. Then, when my girl friend and I were sitting in the cinema watching The Phantom Menace (we knew that Attack of the Clones was being filmed in Australia), we just turned to each other and said "I have to be in the next film." See question number one. It's your opinion that Joclad didn't die on Geonosis. What do you think became of him? 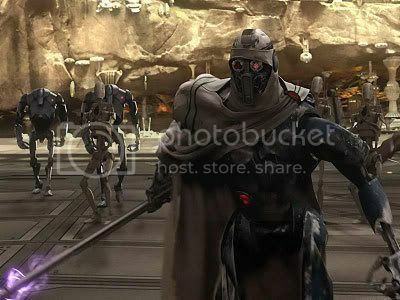 "Yes, we see Joclad on the ground at the end of the Geonosis battle. And, yes, he is badly wounded --but he is definitely not dead. But the Jedi don’t know this and leave him behind for dead in their hurry to escape. A short while after the battle, Count Dooku returns to Geonosis to gather some things he left behind in the heat of battle. Whilst there Dooku senses a life force and goes to investigate. He finds Joclad and knows he is a Jedi, but Joclad can’t remember who or what he is. As Dooku approaches him and as badly hurt as he is, Joclad tries to fight. Dooku respects the courage within this fallen warrior and also the opportunity before him. Dooku gains Joclad's trust and convinces him to let him help him. There I hope that clears everything up for you all. That’s my story and I’m sticking to it. And, tell me: who should know better what happened to Joclad? Someone that reads internet stuff all day, or Joclad himself? ONE MORE TIME, JOCLAD IS NOT DEAD. Keep an eye out for my short film about Joclad's adventures. No, absolutely not. Security around that place was tighter than a deep sea fish's pucker. However, I do have a very cool set of Jedi robes that my mum made for me. She has actually also then made sets for both of my nephews as well, and I made the belts and utility pouches. I have also had a go at making some lightsabers from bits and pieces. They’re okay, but nothing like the things Tommy was making on set. That guy was a genius. You were Nick Gillard's right hand on the films. How was it working with and for him? In all honesty, it was one of the greatest experiences of my life. The choreography and rehearsal for Episode III was three months in total. Ten-hour days, six days a week, and Hayden and Ewan were both there from almost the very beginning. Both of them actually requested to be flown in early to do as much work on the fights as possible. The most important thing for everyone involved -- Nick, Hayden, Ewan and myself included -- was that this fight really told the story of what was going on inside their characters' hearts and minds. Nick’s choreography is amazing and it was brilliant to watch and learn as he tweaked a move here or a sequence there until the whole thing just flowed beautifully and the story was clear and in your face. And with the boys' skills, if something needed changing it was not a problem. They just did it. Of course there are always a few bruised knuckles when you’re fighting fast and in close but that was the worst anyone got hurt in six months; another testimony to Nick’s ability. 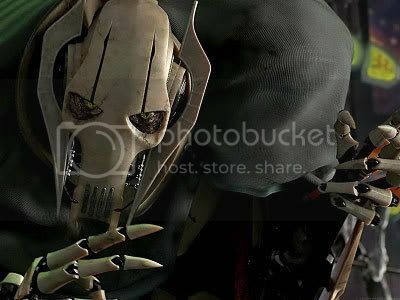 The most fun I had as Grievous, though, was the day we spent filming the last part of the Obi vs. Grievous fight near Grievous’ ship. 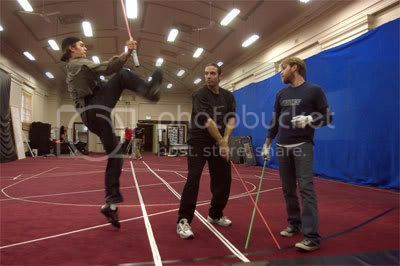 The Obi-wan stunt double -- Nash Edgerton -- and I spent about 12 hours beating the crap out of each other to film all the really big hits, then Ewan came to finish up. Don’t get me wrong, Ewan is no pansy and insisted on taking some good shots that day. But, Nash and I are good friends and know what the camera needs. There were a few bruises, but no love lost. How about playing a MagnaGuard and fighting in the closed confines of General Grievous' ship? Still, you get to run around, jump over stuff, fight a Jedi, kill a droid or two (bad guys got to kill droids in that scene, too, which was cool..."If it’s in your way kill it," was the brief from Nick) and you get paid for it, so yeah it’s pretty cool. Jett’s great. He had to do this scene and being the boss’s son we had to make him look good. Nick was quite busy most of the time, so generally I would work with Jett. He is just a kid, remember, and there was always the desire to play -- so the first thing we worked on was discipline. That out of the way we got down to it and he started doing really well. Cut this head off, stab this guy, now chop off this leg and arm. He’d come up every so often and we would just work through the scene and then, of course, play for a bit. Then, the day came when he had to shoot his scene. Now he is the only one on stage with three hundred people looking at him. We got a call up to our rehearsal room: Jett wanted me on set now. I went down and when he saw me, he just lit up. He ran over and gave me a big hug and then backed off -- all macho again. We went through his sequence a few times and then he was ready to go. At the end of this scene he gets shot by one of the Clone Troopers so I had this prop gun (the one in the Hyperspace photo that started so much controversy) and on "action," I’d call him through all of his moves then call out “JETT!” He’d turn around and look at me, I’d aim the gun on and him and yell "Bang!" and he’d fall down. He did a really good job in the end. I was very proud of him, and George (Lucas) thanked me personally as well. Man, how much time have we got? Like I said, Nick takes his work very seriously, and he takes his fun just as serious. Nick is one of the world's greatest on-set pranksters, he told me some great stories of other movies he had worked on. But I’m not bad myself and I’m pleased to say and I’m sure Nick will attest to this as well that I held my own with him. I had bought these little explosive things. You prime them like a mouse trap, put a weight on it and when the weight is lifted they go off with a hell of a bang. One day I set one on Nick’s desk and used his script as the weight. He walked in and sat down and as he was saying, “Oi, who moved my f*ck*ng script around?”, this thing goes off. We all just dropped and starting crying with laughter. That was it, though. It was now "on" for young and old. We were hiding these things everywhere, blowing up anyone we could. Wow, what a surreal experience. It was an absolute blast, but it was just amazing that these people would want your autograph in the first place...let alone pay for it. But, again, this is part of the pay-off I mentioned earlier. To see the look on these people’s faces when you sign something for them or have a photo taken with them was great. It really made you feel like a star for a while. Gary was very cool and very helpful to someone in a strange land doing strange things. I've heard some rumors about some Matrix-style pictures of you and Gary X when the two of you were in Japan. Of course, our readers want to know everything about this! The first two signings we did in Japan were at this toy store called "Joke Shop," and they had the largest collection of Airsoft replica firearms I had ever seen. Gary and I are both huge gun fans and after the second signing, we chatted with the owner of the store and he let us arm ourselves for bear. The day before, Gary and I both agreed to wear our best Matrix outfits to the second signing and as soon as we were armed, we hit the streets outside the shop and went to town: Pulling poses...pretending to shoot cars and Agents...and each other. Not a thing. Look ,we all look back in retrospect and say, "Oh I could’ve done this, or I could’ve done that." But, we are who we are and we do what we do. There is no point looking back. Either be proud of what you have done, or do it differently in the future...but never doubt your choices if they were truly yours. The SSCS now covers most of the choreographic work in New South Wales for theatre, short films and live performances. We specialize in just about every weapon, from every culture and from every time period. Historical accuracy and period depiction is our specialty. Not that we dress up and run around in Medieval clothing...I’d love to, but my guys keep talking me out of it. But if you want to do that and swing swords around at the same time, we will teach you which sword was right for that period, how it was used in combat and most importantly: how to do it safely. Are there any other Star Wars "alumnus" from SSCS? Any chance we'll be seeing you again in the upcoming Star Wars TV-series? Or, do you have other plans for the future?